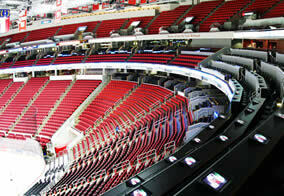 VAB Catering is the exclusive food service provider of the PNC Arena. With more than 50 food and beverage outlets we have every appetite covered. From fast grab and go to casual and fine dining, you will find a wide variety of food options available. Let us make your next event a special event. For more information catering services please visit our Booking Events page. View the VAB Catering Menu for 2018-2019 catering options. We proudly feature our signature NC Barbecue Company Smoked BBQ Sandwich with homemade cole slaw, South Street Cheesesteaks, Panini Sandwiches and Fresh Salads to mention just a few. We also offer local favorites set up with carts throughout the concourse. Review a complete list of Concessions by section and variety. Our foods are fried in Trans-Fat Free Oil. Looking for a fun and exciting fundraising opportunity for your non-profit group? Volunteering at PNC Arena is a great way for groups to raise money while being right in the action! The Arena Club Restaurant is PNC Arena’s premier restaurant which provides a vast selection for every palate. RESERVATIONS: Please call 919-861-6100 or email to make your Arena Club reservations today! The Arena Club Restaurant offers a buffet dining experience including a soup and salad bar, carving station, sauté station, and more, as well as side items all for one price. Tax and gratuity are not included; an 18% gratuity is automatically added for parties of 5 or larger. For Carolina Hurricanes hockey, the Arena Club Restaurant offers a Buffet menu with a large variety of options to choose from. Dessert is also available for an additional charge. Menu options and offerings vary based on each event, please check individual event menus for specific details and pricing. The Arena Club Restaurant also features a 21-foot full service bar with two 50-inch flat screen, LCD televisions. Smaller flat screen, LCD televisions have also been placed throughout the Arena Club so you don’t have to miss a minute of action on the ice or basketball court. For events, please check individual event menus for specific details. You won’t miss a moment of the event in the Ledge Lounge with three 45” flat screen televisions centered in the middle of the spacious, full service bar, while offering a spectacular view of the arena bowl. If your appetite is searching for more than a burger or hot dog and unable to make it to the Club Restaurant then visit our Carvery Carts located inside the Ledge Lounge. The carts offer fresh, piled high carved sandwiches and our famous North Carolina BBQ. Included are homemade chips and all the sides to go with it. *open during Carolina Hurricanes, NC State Men's Basketball games and select events. The Ledge Lounge is also on the south end of the Club Level between sections 226-228 and most easily accessed by using the VIP Entrance, located to the left of the box office. Please park in your designated area and proceed to this entrance and staff members at the VIP Concierge Desk will direct you to the elevators. Hockey: Carolina Hurricanes Premium Season Ticket Holders are invited to join us at the Ledge Lounge when it opens two hours prior to game time. All other ticket holders with Club Level access are invited to join us when the building opens one hour prior to game time. The Ledge Lounge continues serving your favorite drinks as all fans are welcome to join in on the post-game celebration. Carolina Hurricanes Ledge Lounge ticket holders receive a carvery sandwich and (2) two beverage vouchers that may be redeemed for soft drinks, bottled water, bottled beer, small draft beer or house wine (no refills). NC State Men’s Basketball Ledge Lounge ticket holders receive a carvery sandwich and (2) two beverage vouchers that may be redeemed for soft drinks or bottled water (no refills). The Buffalo Brothers Zone includes a 2,000 square foot sports bar overlooking the arena bowl and can accommodate up to 300 people. A variety of beer, wine and Pepsi products, pub-style food, and waiter/waitress table service are featured at this location. The Buffalo Brothers Zone is located on the Main Concourse of PNC Arena between Sections 110 and 114 and is open for most sporting events; not concerts or family shows. The Buffalo Brothers Zone is most easily accessed by using the East or West Entrance. Prior to and during Hurricanes games, access to The Buffalo Brothers Zone is available to anyone holding a Lower Level or Club Level ticket. The same guidelines are in place for most NC State Men’s Basketball games; although the sale of alcohol is restricted due to NCAA regulations. The Buffalo Brothers Zone continues serving your favorite drinks as all fans are welcome to join in on the post-game celebration. If the Arena Club Restaurant is open for an event, the Executive Chefs at PNC Arena create a unique menu selection in advance for your review. The Arena Club Restaurant is also available during the day and on non-event days for meetings and special events. For more information, please visit our booking page. The Arena Club Restaurant is located on the south end of the Club Level between sections 226-228. The Club Restaurant is most easily accessed by using the VIP Entrance at the south end of the building, located to the left of the box office. Please park in your designated area and proceed to this entrance. Staff members at the VIP Concierge Desk will verify your reservations and direct you to the elevators. Reservations are recommended; however, walk up reservations are occasionally acknowledged depending upon seating availability.